“social media is a challenging medium for luxury brands. while it’s tempting and advantageous, it comes with many perils, namely lack of control and placement and associations with mass outlets. 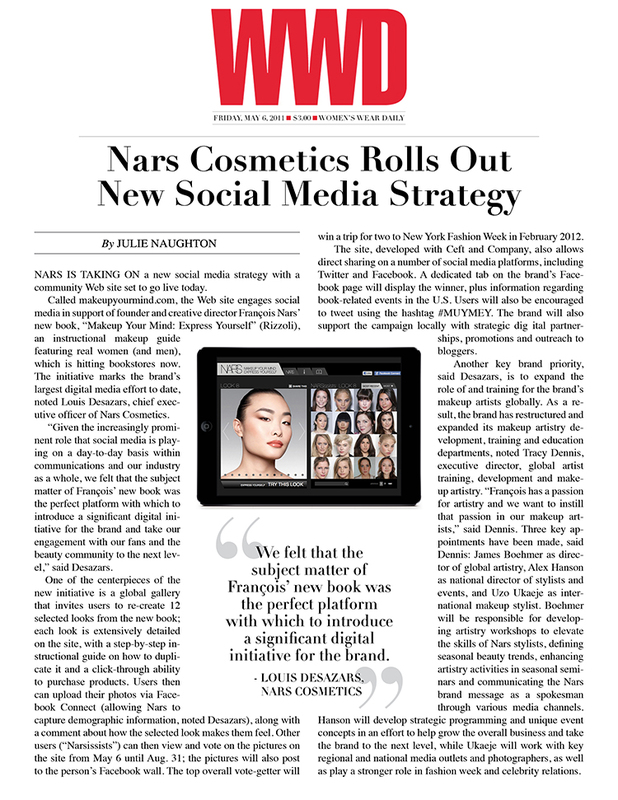 for NARS it was quite apparent that we had to start from scratch and custom build a website that was within the brands aesthetic and sensibility, while incorporating as many available social media channels as possible. we started with a custom interactive facebook app and fangate that allows NARS fans to see the top contestants in real time. the facebook app seamlessly directed traffic to the free standing website where users were able to experience NARS in its full glory. the site structure incorporated facebook auto posts into the comment, photo submission, invites, likes, and shares conducted on the free standing website, as well as twitter, email, digg, and blogger. the site has generated over 20,000 unique visitors just on its launch and we look forward to setting a bench-mark for social media sites to come…” – ceft and company founder and creative director, ucef hanjani. view all work related to this project.